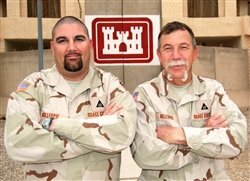 TALLIL AIR BASE, Iraq, Feb. 25, 2009 – An Arkansas father-and-son team is part of the U.S. Army Corps of Engineers’ massive rebuilding efforts in Iraq. Denver and Eric Gillespie, both Navy veterans and ACE employees, soon will complete their six-month tours. What made the deployment so special was meeting, working with and getting to know the Iraqi people, they said. The Gillespies are construction representatives with the Adder Area Office here. Denver is overseeing $150 million in projects, including the expansion of the Tallil airfield, the new Ur Location Command for the Iraqi army, and upgrading two electrical substations in Dhi Qar province. Eric is helping to ensure quality work at seven projects worth more than $50 million, including the new 80-bed Maysan surgical hospital, the Iraqi army’s new Maymona Location Command, expansion of two roads, and the upgrade of the Amarah landfill with a new incinerator, all in Maysan province. One of the highlights of the tour, they said, was visiting Al Haboosh Primary School in December to hand out toys, soccer balls and school supplies to the 225 students there. The school is next to a new $650,000 water treatment plant that will provide access to clean water to that community for the first time. The local tribal leader, Sheik Abdul Razak, said residents there historically had just pumped raw water out of the local canal for household use. Eric noted many of the students at that school were the same age as his sons, Drake, 7, and Caleb, 6.